May the venerable intercession of the glorious Virgin Mary come to our aid, we pray, O Lord, so that, fortified by her protection, we may reach the mountain which is Christ. Who lives and reigns with you in the unity of the Holy Spirit, one God, for ever and ever. The Scapular Devotion | Christian P. Ceroke O. Carm. Sacred Scripture celebrated the beauty of Carmel where the prophet Elijah defended the purity of Israel's faith in the living God. In the twelfth century, hermits withdrew to that mountain and later founded the Carmelite order devoted to the contemplative life under the patronage of Mary, the holy Mother of God. Devotion to Our Lady of Mount Carmel is worldwide, and most Catholics are familiar with the Scapular of Our Lady of Mount Carmel, also known as the Brown Scapular. Mary appeared to St. Simon Stock on July 16, 1251, and gave him the scapular with the following words, which are preserved in a fourteenth century narrative: "This will be for you and for all Carmelites the privilege, that he who dies in this will not suffer eternal fire." The feast of Our Lady of Mount Carmel was instituted for the Carmelites in 1332, and extended to the whole Church by Benedict XIII in 1726. Today is the principal feast day of the Carmelite Order. Through the efforts of the crusader Berthold, a group of hermits living on Mount Carmel were organized into an Order after the traditional Western type about the year 1150. Oppressed by the Saracens, the monks slowly emigrated to Europe. During the night preceding the sixteenth of July, 1225, the Blessed Virgin is said to have commanded Pope Honorius III to approve the foundation. Since the Carmelites were still under constant harassment, the sixth General of the Order, St. Simon Stock, pleaded with the Blessed Virgin for some special sign of her protection. 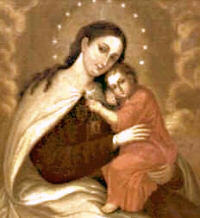 On July 16, 1251, she designated the scapular as the special mark of her maternal love. That is why the present feast is also known as the feast of the Scapular. The scapular, as part of the habit, is common to many religious Orders, but it is a special feature of the Carmelites. A smaller form of the scapular is given to lay persons in order that they may share in the great graces associated with it. Such a grace is the "Sabbatine privilege." In the so-called Bulla Sabbatina John XXII affirmed that wearers of the scapular are soon freed from the flames of purgatory, at least by the Saturday after death. The confirmation of the Bulla Sabbatina was promulgated by the Sacred Congregation of Indulgences, July 4, 1908. If you have not already done so, have a priest enroll you in the Scapular of Our Lady of Mount Carmel, or popularly known as the "Brown Scapular" and begin wearing it as a sign of your love for Our Lady. A priest enrolls people in the Brown Scapular only once. The Scapular can then be replaced afterwards by other scapulars or the scapular medal, which has on one side the image of the Sacred Heart of Jesus and on the other, the image of Mary. The medal needs to be blessed by a priest, but the cloth scapulars do not require a blessing (separate from enrollment). 205. The history of Marian piety also includes "devotion" to various scapulars, the most common of which is devotion to the Scapular of Our Lady of Mount Carmel. Its use is truly universal and, undoubtedly, it is one of those pious practices which the Council described as "recommended by the Magisterium throughout the centuries." The Scapular is imposed by a special rite of the Church which describes it as "a reminder that in Baptism we have been clothed in Christ, with the assistance of the Blessed Virgin Mary, solicitous for our conformation to the Word Incarnate, to the praise of the Trinity, we may come to our heavenly home wearing our nuptial garb." The imposition of the Scapular should be celebrated with "the seriousness of its origins. It should not be improvised. The Scapular should be imposed following a period of preparation during which the faithful are made aware of the nature and ends of the association they are about to join and of the obligations they assume." Therefore two truths are evoked by the sign of the Scapular: on the one hand, the constant protection of the Blessed Virgin, not only on life's journey, but also at the moment of passing into the fullness of eternal glory; on the other, the awareness that devotion to her cannot be limited to prayers and tributes in her honor on certain occasions, but must become a "habit", that is, a permanent orientation of one's own Christian conduct, woven of prayer and interior life, through frequent reception of the sacraments and the concrete practice of the spiritual and corporal works of mercy. In this way the Scapular becomes a sign of the "covenant" and reciprocal communion between Mary and the faithful: indeed, it concretely translates the gift of his Mother, which Jesus gave on the Cross to John and, through him, to all of us, and the entrustment of the beloved Apostle and of us to her, who became our spiritual Mother. For the definitive treatment on the brown scapular, read The Scapular of Our Lady of Mount Carmel: Catechesis and Ritual. The Blessed Virgin's scapular should remind us that Christians have an apostolate against current extremes and extravagances in modes of dress. Clothes are a symbol of the person. Like the Christian heart, dress must be chaste and simple, for one judges the interior from the exterior. It should not be necessary to add that special attention be given this matter when preparing for church attendance. Examine yourself on how well you reflect Christian modesty in your dress and if you are a parent, how well you ensure that your children are modestly dressed. In New York City in East Harlem is one of the oldest festivals in America for Our Lady of Mount Carmel. See Our Lady of Mount Carmel Shrine of East Harlem – since 1881. Also Williamsburg in Brooklyn, NY annually holds the Festival of Our Lady of Mt. Carmel and St. Paulinus of Nola (Festa Del Giglio). It is unique to see a scene that one would expect in Europe unfolding on the street of a major East coast city. You can view a You Tube clip right here. Also look around your area for Italian parishes, maybe one named after Our Lady of Mount Carmel? Many times the parish will host wonderful festivals in her honor. Watch this You Tube video to learn more about devotion to Our Lady of Mt. Carmel. From the Catholic Culture library, the Scapular Devotion, a description of Different Kinds of Scapulars, The Brown Scapular and information on the Scapular Medal. Learn more about St. Simon Stock and the Brown Scapular.